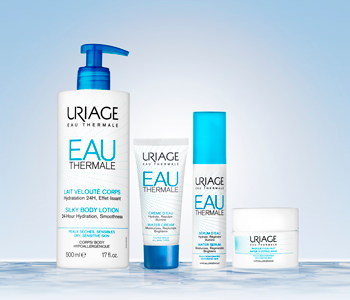 Replenish lost moisture in the skin with the Uriage Eau Thermale skincare range, a collection of deeply hydrating formulas for thirsty complexions. For skin that’s parched and lacking in the moisture department, the Eau Thermale range from Uriage works hard to top up your skin’s moisture levels whilst respecting and preserving the hydrolipidic film. Thanks to an infusion of signature Uriage Thermal Water in each product, your skin will benefit from natural isotonic benefits that strengthen the complexion with enriched mineral salts and trace elements.